I suddenly woke up, a bright sunny morning awaited me, with the sound of the birds and the light breeze against the trees. It was the day that I would to to my lesson and ride my Favorited horse prince! Since it was the summer my trainer had lots of kids coming for lessons and camps and a few day ago she asked me if I could help so I would be there all day. I stated getting ready quietly because my parents were still sleeping, after I took a shower I had breakfast, dried my hair, put my breeches on along with my tall boots. Since I lived so close I would just bike there. Going up the long drive way I noticed that there was a truck and trailer and on the side it said "m and m slaughter" so quickly I biked to see what was going on two men and my trainer were tying to get what looked like a young black Thoroughbred out off the trailer. I stared until my trainer handed me the horse and said " this is your new prospect Thoroughbred" the horse looked very worried about the new surrounding " your job is to have him trained by the end of the year and he is your" with excitement I quickly hoped off my bike and just stared at him with nothing to say. 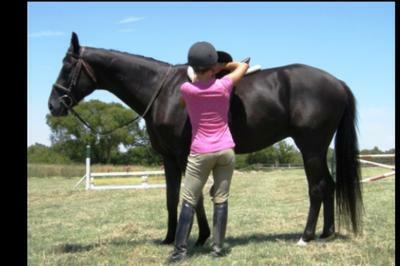 My trainer added " he is a 3 1/2 year old gelding." I turned him around to give a look and noticed that he had BURNS every where from an inch under his withers to the hindquarters. " He was abused and let to be burned in a barn fire, nobody cared to help him" shocked that someone would do that I quickly put him in the crossties and prepared to lunge him before his first lesson. I don't get why people do that. People sometimes do that and I just don't get it.